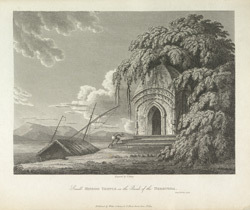 Plate seventy-one from the third volume of James Forbes'"Oriental Memoirs". Forbes(1749-1819) also had the jurisdiction over the district of Chandod whilst he was Collector of Dhaboi. Chandod was considered a sacred spot by the Hindus of Gujarat and huge groves of Banyan and Peepul trees grew interspersed by a great many temples on the banks of the Narmada River.